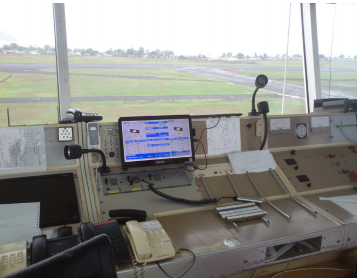 Campbell Scientific’s system integrator, AUDIMOBIL LDA, recently upgraded the airport weather system in the S. Tome International Airport (IATA: TMS, ICAO: FPST), in the São Tomé and Príncipe Archipelago off the western equatorial coast of Central Africa. The existing system for supporting this infrastructure had been disabled, which in turn was restricting the airport's daily operations. The project included updating system dataloggers (to Campbell Scientific CR800 and CR1000 models), as well as all the sensors and software. New sensors included the Campbell Scientific CS135 LIDAR Ceilometer, the CS125 Present Weather and Visibility Sensor, and the CS140 Background Luminance Sensor (for IRVR calculation). The new equipment was integrated to fully function with the existing installation and communications. The sensors were distributed between two runway extremities: one wind sensor was installed in the extremity of RWY11, and the other covers the remaining variables in the opposite extremity of RWY29. This configuration was chosen because more than 90% of all take-offs and landings are made in the RWY29. System training was provided by AUDIMOBIL at their premises for an Airport Technician. This training familiarized the technician in the operation and maintenance of the entire system, guaranteeing a better response time in actions of corrective maintenance. The entire system can be remotely accessed for follow-up and software updates. To facilitate the reading of the information generated by the stations, two different interfaces, with the instantaneous information generated by the stations, were developed, and many processes streamline the entire decision-making. The main interface runs in the Command PC, with access to the information in real time, historic, and maintenance, while the second runs in displays placed in the Meteorological Service, Airport Control Tower, and Air Space Control Room.